The north side of the stadium tower provides a framework to support the project’s extensive art program. Shown here are the four disks that compose “Earth Dialogue” by Bob Haozous. With a dynamic and beautiful city like Seattle, designing a new city landmark through an NFL stadium was a challenging task. A balancing act between form and function is inherent within the design process but the ultimate goal is clear: creating a highly flexible and successful icon for the city of Seattle. Aesthetically, the new stadium must stand on its own merit by contributing to the exotic city landscape. Yet the building must also respect the existing context and urban fabric that blossoms around it. Design cues must creatively blend old and new while minimizing the impact this large structure will have on its neighbors. An aesthetically pleasing design is only part of the equation. Today’s sports venues must be intelligently arranged, providing the most diverse seating options and easy access to amenities and the modern conveniences that fans have come to expect. With the stadium nearly complete, its first impression has been made on the city and its citizens. The culmination of the design and construction process reveals that Seahawks Stadium is a dynamic place, much like the city in which it resides. Two elements are at the core of Seahawks Stadium’s design: a dramatic roof and the contextual integration of the surrounding neighborhood districts. 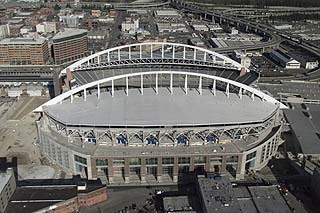 Identifying the new stadium from numerous vantage points and distances from around the city, the dramatic roof structure is the signature element of Seahawks Stadium. The design of the 720-foot rainbow span relates in form to adjacent Safeco Field’s roof, yet makes a fundamentally different statement. Architects designed the stadium with its surrounding context in mind. The 720-foot rainbow span relates in form to neighboring Safeco Field, and the west façade — with its masonry, columns and beams — recalls Pioneer Square. 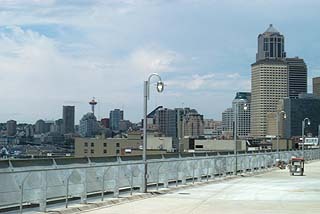 Rather than blending with the dark steel context of the nearby rail yards, Seahawks Stadium’s white-painted steel span becomes a shining skyline presence. Visually the roof appears to float over the base of the stadium. Functionally, the roof provides numerous advantages, all of which contribute to the spectator’s enjoyment. For example, more than 70 percent of the seats are covered while also allowing for optimal speaker placement, enhancing sound quality. The extension of the long-span roof over the seating bowl allows for speakers to be located in advantageous positions unavailable in other stadiums. The design of Seahawks Stadium draws its inspiration from historical precedent and the local context to create a contemporary facility grounded in historically significant districts. Located on the southern edge of Seattle’s commercial core, the site is bounded by diverse historical neighborhood districts. Thus, an important goal became inherent throughout the design process: draw upon the strong historical commercial and industrial architectural context while enabling the stadium to create a place for itself within the urban context. Inside the stadium, the openness of the design allows for unprecedented views from the concourses. Overall, the site design creates connections both physical and visual to these important neighborhoods and weaves the area together in a logical and coherent form. The massing of the stadium is composed of a masonry base that gives way to the concrete seating structure and, ultimately, the steel roof element. The 85-foot high base contextually relates to its immediate surroundings through a combination of color, scale, mass, texture and height. 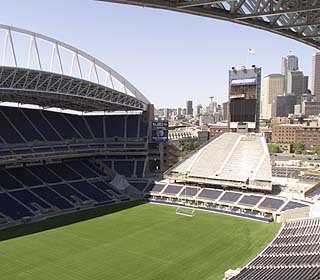 The stadium seating is U-shaped with the open end of the “U” facing north, offering stunning views of downtown Seattle. The north end zone also features a seating and end-zone scoreboard tower that mediates the space between the stadium seating and the north plaza and terminates Second Avenue. 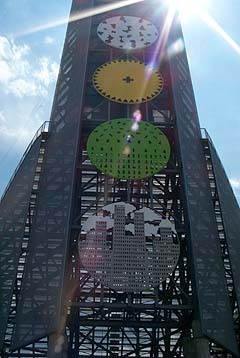 The side of the tower facing inside the stadium features a high-tech scoreboard and videoboard system while the opposing side provides a framework to support the project’s extensive art program. The scale of the tower is appropriately proportioned to address the various scales of the view to downtown as well as the size and scale of the north plaza. A partially open end zone to the south allows for views to Safeco Field’s roof, but the most defining visual link to the south and southeast is Mount Rainier. The west side of the stadium’s façade relates to Pioneer Square by featuring masonry, columns and beams and punched openings in the masonry. Large-scale banners integrated into the Occidental colonnade and within the circulation ramps serve the functional purpose of conveying information about upcoming events but also serve to reference the “ghost paintings” found throughout the neighboring districts. Conversely, the east side of the stadium relates to the larger scale of the International District and the freeway by revealing a continuous curtain wall above the masonry. From within the stadium, the openness of the design allows for unprecedented views from the concourses to the surrounding neighborhoods, Safeco Field to the south and Elliot Bay to the west. The open end of the stadium’s U-shaped seating faces north, offering stunning views of downtown Seattle. To further integrate the stadium with the surrounding area, the north plaza is designed to be a major urban plaza for the city of Seattle year-round and as an entry area for stadium and exhibition center events. It will also be a primary area to hold special events and pre-game activities. Regardless of whether it is Seahawks football, Sounders soccer or any number of special events, Seahawks Stadium provides the city of Seattle with a modern and highly flexible venue. Perhaps just as important, by paying careful attention to neighboring districts and their architectural styles, Ellerbe Becket has designed Seahawks Stadium to be an inspired addition to the city skyline and urban fabric. Ron Gans, a designer and associate with the Kansas City, Mo., office of Ellerbe Becket, helped create Seahawks Stadium.